The fishing is still going well from Cairns as it always does at this time of year. We had a trip out amongst the Tuna aggregation and caught 4 marlin from 10 bites over the 3 days, 3 blacks(700, 600, 250) 1 Blue(300) and lost a few others. 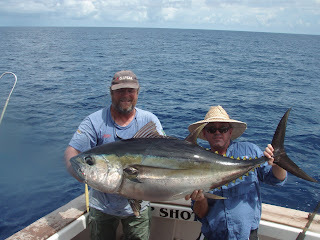 More tunas than you can poke a stick at, all caught jigging with Bigeyes,1 over 100lbs, 1 over 90lbs and yellowfin,1 @ 80lbs. There were numerous schools 200 meters deep under the boat for as long as you wanted to catch them, with the kind of action which is hard to describe here. Awesome stuff!!! Have also been doing some light tackle days catching mackerel, dolphin fish, bottom fish etc. Am out marlin fishing on Monday, so hopefully some good reports to come.